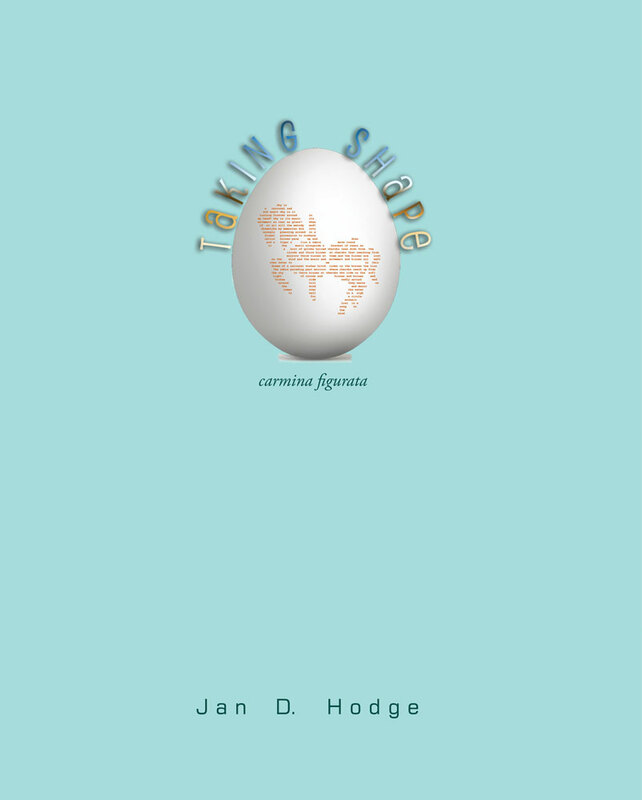 An eclectic mix of shapes and subjects populate Taking Shape—Jan D. Hodge’s full-length collection of carmina figurata (sometimes called shaped poems, pattern poetry, or figure poems). Hodge’s many masterpieces include depictions of a saxophone, a Madonna and Child, a combination piano/guillotine, and other silhouettes of amazing difficulty and detail. These poems are not only visually stunning, they are also sonically beautiful, and retain a transcendent freedom while conforming to both illustrative and metrical constraints. Taking Shape is a visual feast of inspired poetry. Here is a perfect matching of shapes and poetry. Through a wide-ranging array of subjects and tones, Hodge’s mastery of language within such challenging constraints is truly impressive. Syntax and rhythm, metaphor and symbol (see for instance “The One That Got Away” or “The Lesson of the Snow”), conversational snippets and quatrains, are surprisingly nuanced. Even the occasional poems—wedding, elegy, Valentine’s day, Halloween, Christmas, an early morning poetry reading—find new things to say and striking ways to say them. These poems reward reading again and again. Jan D. Hodge is the master par excellence of carmina figurata. In Taking Shape you’ll see such word-pictures as the Chinese ideogram for spring; a harpsichord poised before a guillotine; a still life with quill pen and ink bottle, T-square and drafting triangle. More amazing still, Hodge forms many of the intricate images with metered language—in one case in medieval alliterative verse! In a poem about baseball Hodge writes, “forgiveness/ is the best/ we dare hope for in this bruised world/ the thinnest/ chance that lets us somehow/ slide home free”; here “only by grace . 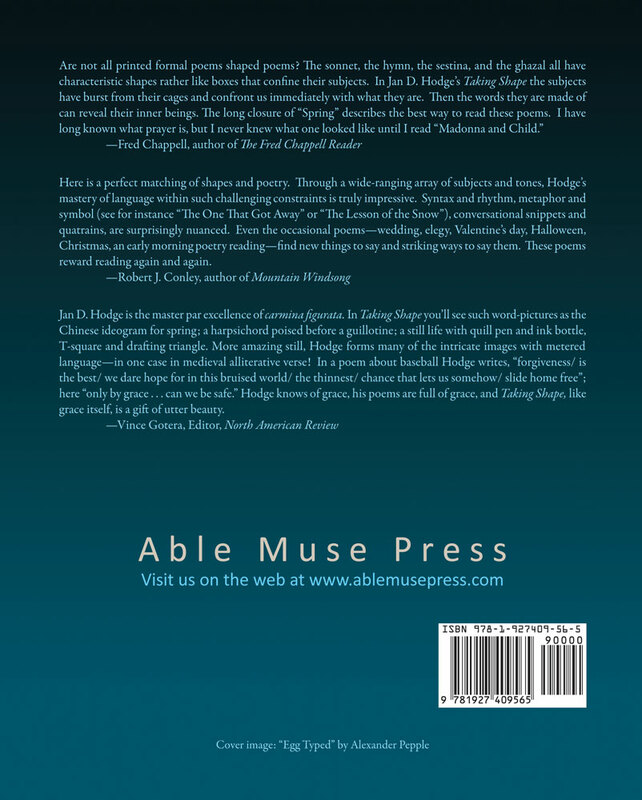 . . can we be safe.” Hodge knows of grace, his poems are full of grace, and Taking Shape, like grace itself, is a gift of utter beauty.